As far as ‘religious’ themed movies are concerned, probably in terms of popularity and how much it has impacted the world, The Passion Of The Christ tops the list. A list made by myself, or by critics, or other movie-goers, or other reviewers…any list you could think of in terms of how much a biblical movie has impacted the world, Mel Gibson’s ambitious yet thought provoking and highly relevant and refreshing take on Jesus’ death and resurrection no doubt tops the list- in terms of the extent of the impact on people’s lives, either positive or negative. The movie is still stirring the hearts of many and changing lives 12 years after the movie release date. Now this year, another movie has released, this time focusing on the aftermath of Jesus’ death, in the eyes of a Roman Centurion. Risen stars Joseph Fiennes, and is about the centurion Clavius, tasked by Pontius Pilate to locate the body of Jesus after his resurrection. With the film dropping this week to cinemas, just in time for Easter at the end of March, the companion album Risen: Songs That Celebrate the Epic Film has been unveiled as well. Word Label Group has compiled a soundtrack album to the movie, with 11 well known worship and CCM/pop songs sung by up and coming artists and seasoned veterans, all of them reminding us of the fact that Jesus has risen, and that He is with us, so we have nothing to fear in this life! So let’s dive in, and see if we can be blessed and inspired as we approach Easter coming in a month or so! Opening proceedings is Love & The Outcome’s smash hit “He Is With Us” from their 2013 debut self-titled album. One of the most popular and played songs on the radio in 2013, there’s a catchy and contagious chorus lyrically, as well as musically, with the track being the duo’s testimony of God’s faithfulness and promises over the past few years, and an assurance that we can trust Him in all circumstances. From the first time listening to the song, it was plain to see that Jodi and Chris both had a winner; as even now as I write, the song is still in my head (2 and a half years since it’s released- definitely a good thing!). Add the creative music video to the mix, and you’ve got a song that has catapulted Jodi and Chris firmly into everyone’s living rooms, and our hearts. As Jodi emphatically declares that ‘…we can trust our God, He knows what He’s doing, though it might hurt now, we won’t be ruined, it might seem there’s an ocean in between, but He’s holding onto you and me, and He’s never gonna leave…’, we are reminded of the extent of God’s love, and should be grateful and thankful for God’s providence in our lives! The rest of the tracks brilliantly and skilfully impart to us the truth of God’s presence in our lives, that the grave was not the end for Jesus, that we do have a reason to celebrate. Francesca Battistelli’s “Tonight”, with guest vocals David Leonard and Leslie Jordan of All Sons And Daughters, is somewhat of a soothing and calm lullaby; and is in every sense of the word, a prayer to God for guidance and direction, and for Him to come to us and bring us peace and security. The inspiring mid-tempo ballad “Come To The Table” is essentially an invitation for everyone to accept the free gift of salvation that Christ is offering to us, as Dave from Sidewalk Prophets authoritatively expresses for everyone to ‘…come to the table, come join the sinners who have been redeemed, take your place beside the Savior, sit down and be set free…’, amongst the keys, guitar and mesmerising drums. “Find Rest” from Dara Maclean is another favourite song of mine, as the piano prominent ballad tells us that God is the one whom we can rely on to give us rest. Reminiscent of something that could have come out of the hymns, the verses are very vulnerable, as is the simple chorus that reiterates that ‘…in You I find rest…’. Holistically the song reminds me thematically of Lindsay McCaul’s “Come Rest”, as well as Rebecca St James’ “Quiet You With My Love”, and is a fantastic inclusion as we are reminded that the One who rose from the grave can provide us with the much needed rest we desire. Zealand Worship, the brand new worship band headed by ex-Newsboys member Phil Joel, are present here also, with “Savior”, from their debut self-titled EP. With the melody having a Delirious? or for KING & COUNTRY musical vibe to the melody, there’s plenty of electric guitars and synth present in this mid-tempo worship song; as Phil eloquently cries out that God is Saviour, now and forever, and that He always keeps saving us now and into the future, which should provide us comfort whenever we mess up or feel like we need God more than ever. While newcomer rock band band VERIDIA offer up “Mystery Of The Invisible”, a piano ballad overtly alluding to God’s presence being in everything we interact with, from creation to the manmade structures of the city; speaking about believing in the unseen and having faith where we can’t tangibly measure the existence of God. The band believe in Jesus because ‘…I’ve heard the sound of the ancient hymns, I’ve felt the chills of the cool, cool wind…’, reminding us all that Jesus’ love is alive in us, and that should make us all feel something in us that’s not dead, that’s bigger than ourselves, and that loves us for everything we are. Releasing her brand new album Deeper today, Meredith Andrews’s new song “Impossible” is included here as well, a light electronically driven melody about how God never fails us, that ‘…there’s not a day that You won’t go before me, and even when I’m at the end, I will not forget it’s impossible for You to fail…’, as Meredith passionately and eloquently recounts instances of God showing up in the lives of ordinary men and women in the Bible. While “Matter” from for KING & COUNTRY is another personal highlight of mine, as the brothers from Australia Joel and Luke ardently proclaim that we all matter in the eyes of Jesus, that ‘…to the One who spoke and set the sun ablaze, to the One who stopped the storm and walked the waves, to the One who took the tree so He could say, you matter, I hope you know you matter…’. The tempo and musical atmosphere shifts again to soul and funk later on in the track list, with Chris August’s offering “Find You To Find Me”, with hand claps, finger clicks and a jazz influence throughout, reminding us that we can only truly find ourselves when we find God and understand everything He is to us, and everything He’s done for us. In my opinion, the only song which doesn’t really hold my attention sadly, is Big Daddy Weave’s “Save My Life”, which is severely dated, and containing the same themes as Sidewalk Prophets’ song of the same name, which is catchier, basically outlining the same thing- that only Jesus can save our lives. The final song on the album, ending a stellar musical journey, is Paul Baloche’s “He Is Risen”! “He Is Risen”, already previously recorded by Graham Kendrick, is a slow paced song that is driven by stirring electric guitar riffs with an anthemic crescendo that brings us all in communion with God. Guaranteed to be on the Sunday set list in churches around the world in many years to come, the affirmation by Paul and repetition of the words in the moving chorus that Jesus is risen from the grave, will no doubt be quickly on our lips as we passionately and fervently sing along with Paul the unending truths about our Saviour. As God is living and dwelling inside of us, inhabiting the praises of his people, what better way to acknowledge His presence in our lives than to sing about Jesus’ resurrection! Handpicking songs directly relating to Jesus’ resurrection, the overall meaning and impact it has for us today, as well as the realisation that He is risen, therefore we can live like we are free because we are; the soundtrack to the movie Risen contains some pretty impressive artists singing well known and original songs. 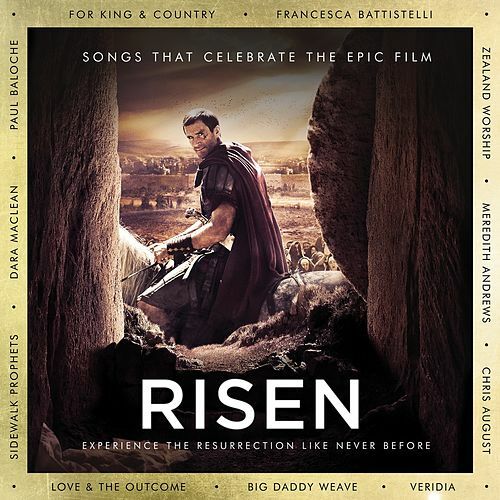 From Paul Baloche and Sidewalk Prophets to VERIDIA and for KING & COUNTRY; Risen: Songs That Celebrate the Epic Film is a must for any fan of worship music, any fan of biblical movies, faith based media, or any fan of historical movies. Or all or any combination of the above. So what are you waiting for? You will find a worship song on the album to inspire you and possibly change your life; so dive in, and let me know your thoughts! Well done everyone involved as you minister to others in your sphere of influence!